Doesn't this look so lovely, especially with those sliced apples on the side? This seems like a great use of leftover turkey. "This quiche could serve as a quick portable breakfast or even a light lunch/dinner alongside a green salad," writes Shannon. "Not a dense quiche, the lighter texture might be appreciated in the days after the big feast ;)"
I'm of the opinion that (nearly) anything wrapped in bacon is delicious, and this recipe has a bit of a kick to it as well, which makes it doubly delicious. "Basically, this is awesome," writes Jen. "It would make a great appetizer year-round." I'm always curious about vegan versions of pastries that are typically loaded with butter. Some are phenomenal; others not so much. At least appearance-wise, this one seems worth a try! "These cinnamon rolls are made without any animal products, but vegans and omnivores alike are sure to love them" writes Lauren. "Serve the rolls as part of a special Thanksgiving brunch, or for breakfast on just about any day of the week." Pam returns from a brief blogging hiatus to bring us this Greek masterpiece, which includes pumpkin puree and feta. "I ended up making this twice in one week because it was so good," writes Pam. "The first time, I could barely hold myself back from cutting into it - I wanted to wait until dinner, but instead I declared it an appetizer (hours early?) and just dug in." Still hungry? Check out last week's featured recipes! These look amazing! 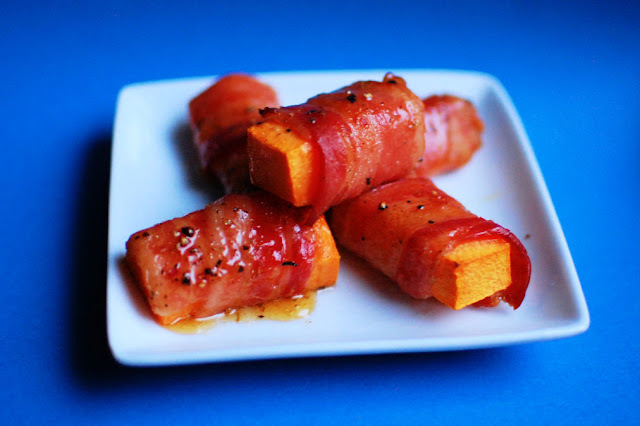 I think the bacon wrapped squash should be photo of the week too! Love the wonderful variety in the photos.